As the summer growing season slows, your containers may need a bit of sprucing up for the fall. There are so many wonderful plants to add color, texture and new life for fall. 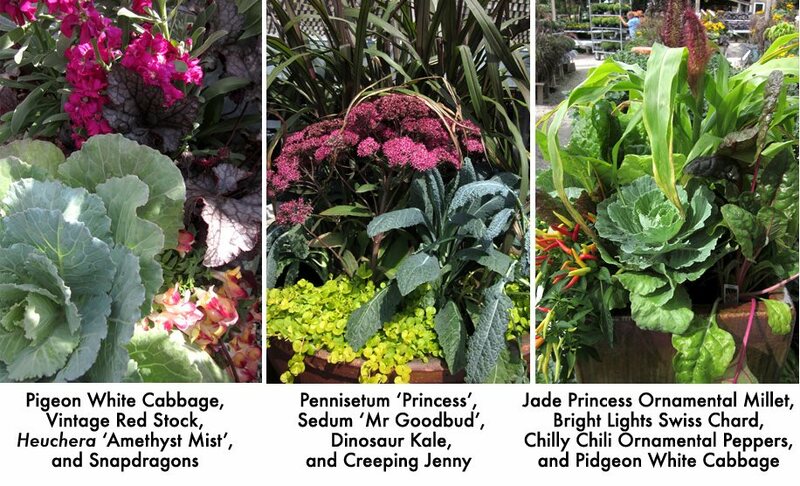 Of course, mums are at the top of our list but there are so many other great plants that love these cooler temperatures. Cabbage and kale give your containers color and texture. This year we have cabbages and kale in small, large, and extra extra large! Pigeon White and Pigeon Purple Cabbage are great for smaller containers. 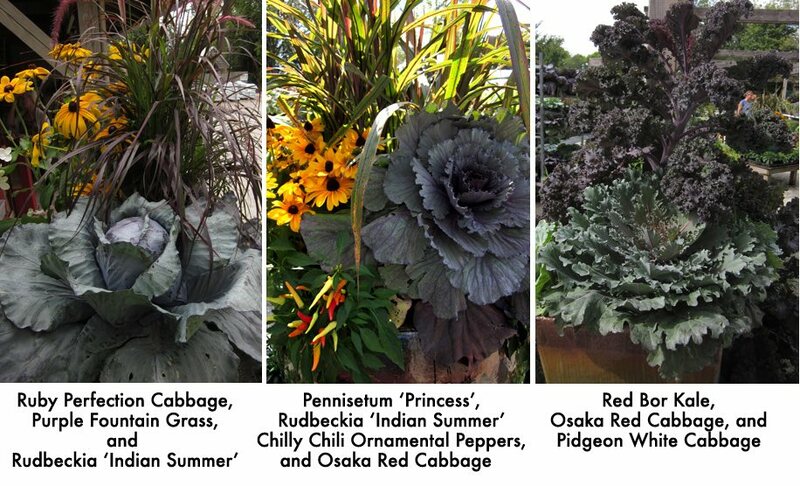 Osaka White and Osaka Red Cabbage and Chidori Red Kale will give your containers an interesting focal point. Extra extra large Ruby Perfection and Peacock Cabbages and Red Bor Kale are so big they can fill your container and will also look stunning in the ground. Add a colorful Calibrachoa for great color fill in that will last through fall. Purple Majesty Ornamental Millet is a bold burgundy-purple color with strong dark plumes that makes a fabulous partner to the bright sunshine yellow blooms of Rudbeckia hirta ‘Indian Summer’ or ‘Tigereye Gold’. Consider a filler of Bright Lights Swiss Chard with its green leaves and stems of yellow, red, pink and orange. Dinosaur Kale with large sea foam green leaves also contrast nicely with Purple Majesty. Creeping Jenny (Latin name: Lysimachia nummularia ‘Goldilocks’), is that bright lime green pop of color that spills down the container. Pair it with Osaka Red Cabbage and Rudbeckia hirta ‘Indian Summer’. If you like that bright green color in your container consider using Jade Princess Ornamental Millet. The bright green leaves seem almost to glow in the dark. It pairs well with any color mum, a Sedum, the golden yellow of Japanese Sweet Flag Grass (Latin name: Acourus ‘Ogon’) or event a Coral Bell with a dark purple leaves like ‘Amethyst Mist’. This is just an outstanding contrast of color perfect for fall. Consider planting a fall container that will transition through the winter holidays. An evergreen is ideal, we suggest either a Dwarf Alberta Spruce or Green Velvet Boxwood in the center of your container. They are hardy and will hold their strong shape and color in the coolest of temps. Seasonally, you can then surround the evergreen with plantings of mums, cabbage or bittersweet branches for fall and then assorted greens, decorative branches, and winterberries for the winter. There are so many options for your containers. Come see us on Saturday and we’ll help you design one just right for you! Want Help Creating a Fall Container? Join us this Saturday, 9/12 between 10:00am and 12:00pm for our Make and Take: Fall Container workshop. A designer will be available at both locations. Bring in your own container, purchase one of ours, or simply plant in one of the plastic drop-in containers (we’ll have 3 sizes available). Best of all, glazed ceramic containers are 20% off. Provide drainage. Good quality containers for outdoor use should come with drainage holes. The second part of the drainage equation is keeping the soil in while letting the water out. You can use plastic window screening over the holes, but we have also used burlap. They will help keep the drainage open as well as allow for air to flow below the container. Use a lightweight potting mix. We recommend mixing in a slow-release granulized, fertilizer before planting your container. The constant watering of the containers washes away the nutrients needed by the plants. The slow release will continually nourish your plants. Water consistently. To figure out if your plants need water, stick your finger down into the soil, up to the second knuckle. If your finger tip feels dry, add water. Layer large containers. Plants only need about 12-18 inches of soil. When planting large tall containers place uncapped empty water bottles or use an Ups-A Daisy™ to create shelf to support the potting mix in containers. Prepare for winter. If you are leaving your large containers outside for the winter, be sure that they are only half full or completely empty of soil. The soil expands and contracts during the continual freezing and thawing of the winter which is what can cause containers to crack—especially glazed and unglazed ceramic. A half full container allows for plenty of room for the soil to move during the winter. Make sure your containers are elevated off the ground on “feet” to prevent them from freezing to the ground.